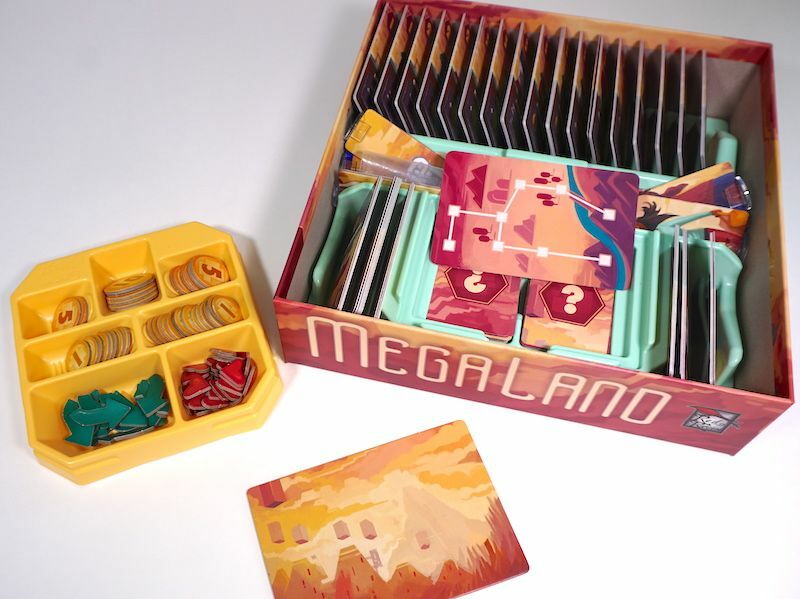 MegaLand has two main phases: in the first phase, you press your luck by drawing cards to gain more treasure and risk meeting more enemies (much like Incan Gold). In the second phase, you turn your treasure into buildings to earn coins and bonuses (much like Machi Koro). Mashing together the press-your-luck and tableau building game mechanics with a family-friendly theme gives us a game that feels familiar but fresh. MegaLand supports up to five players. 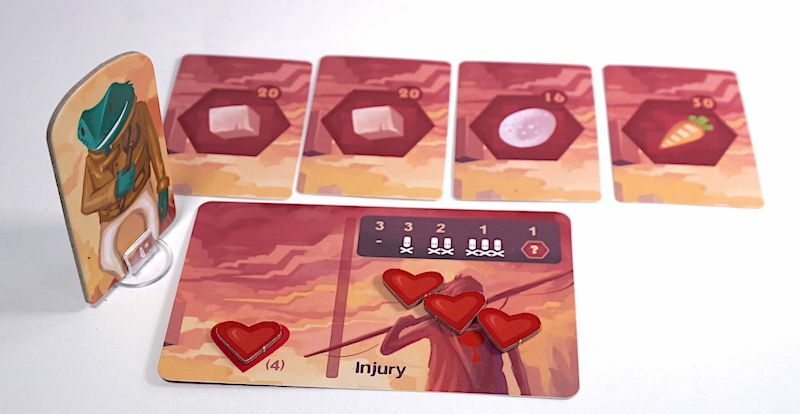 Each player gets a placeholder card and four heart tokens, along with a character standee. At the center of the table, we set up the “level” deck and the “level tile”, a carboard platform to hold all the standees. We’ll shuffle the 96 treasure cards and keep them nearby. We’ll also set up 13 different types of building cards: six “star” buildings, which are the same for every game, and 7 other buildings which we’ll pick from an available 17. Each round of MegaLand plays out in three phases: “Running the Level”, Buy, and Night. All players place their characters on the “level tile” and draw a treasure card. The first player draws from the level deck and puts it face up next to the level tile. That card may contain an enemy (which does damage to all characters), a treasure chest, or nothing at all. Each enemy card does damage, taking away 1-3 hearts from each player. You can’t fight these enemies, but some can be “jumped” by spending a jump token (provided by certain buildings) and declaring before the card is turned over that you would like to jump. Watch out! Flying enemies cannot be jumped, and you will still lose your token! If you lose all your hearts, your character will “fall”. Discard all your treasures from this run and return home. Once a level card has been resolved, each player makes the decision to continue on the level or return home. If you stay, draw another treasure before the next card is flipped. Otherwise, remove your character from the level tile and wait for the Buy phase. Players take turns buying buildings and/or hearts during this phase. Each building has a cost representing a number of unique treasures. 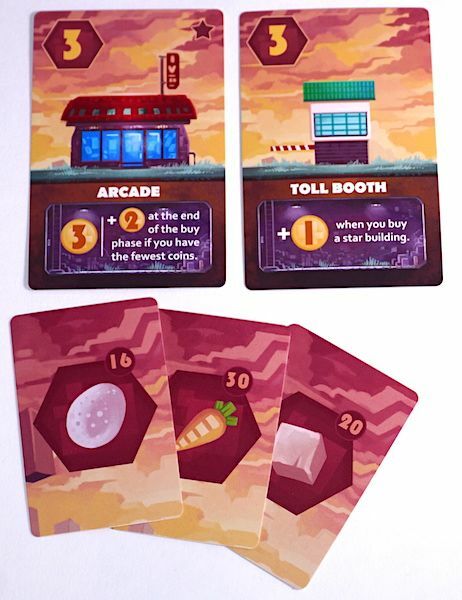 Players may buy as many buildings as they have cards for, although you may only buy one of each building type on your turn. Most buildings give coins; some give coins up front and some through special abilities. Some buildings also give abilities to ignore certain monsters or manipulate your treasures. Every game will feel different, depending on which buildings are available to buy. You may also buy extra hearts to add to your player card. To buy a heart, you pay with matching sets of treasures. Each additional heart becomes more expensive. After all players have had a chance to buy, the Night phase begins. This is the time to pass the first player marker, reset your hearts on your player card, and re-shuffle the level deck to prepare for the next round. Night is also the time to store your treasures. Any treasures you have not spent must be discarded – unless you have room for them in your buildings! Each building can “store” exactly one treasure card. Some buildings also give coins or treasures at night, indicated by a moon symbol on the ability. The game ends when one player has at least 20 coins at the end of the Night phase. The player with the most coins is the winner. MegaLand is thematic. 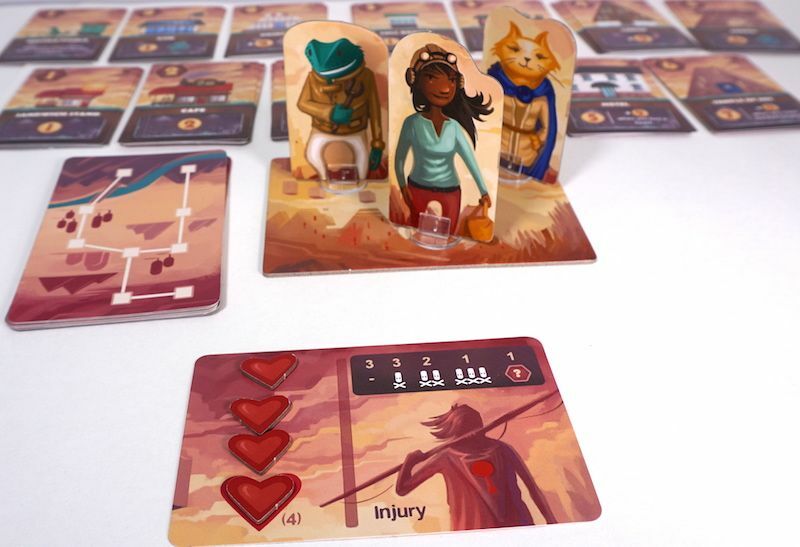 We always found ourselves drawn into the tension as players decide whether to take more treasure and risk running into a monster, or return home with a paltry collection. The video game theme carries into every aspect of the game and translated the mechanics in a way that was very easy for our kids to understand. Unfortunately, the press-your-luck mechanic, combined with the upgrades available, means that victory can sometimes be assured early in the game. 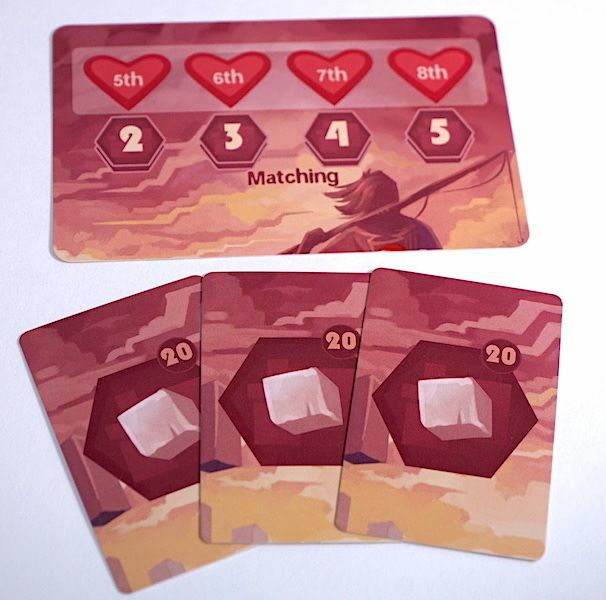 With the right combination of treasure cards, a player may buy more hearts and quickly jump out in the lead, since they risk less by continuing past their competitors on each level. We had a few games like this that were very frustrating, but others that were lots of fun. Most of the time, the gameplay felt just a little bit too long. Truthfully it was less of an issue with Megaland than some other games, but it was still there on occasion. We rarely had a game that held every players’ interest to the very end, probably because we always went a lot longer than the 20 minute time advertised on the box. Speaking of the box, we don’t normally show you the inside, but the Game Trayz organizer that comes with MegaLand is worth showing. It keeps everything organized so setup is quick and easy. I really appreciated the three different sizes of cards in the game. It’s easy to keep track of what you’re doing since the treasure cards are small, the buildings are a standard size, and the level cards are oversized. You won’t get these mixed up, even if you don’t use the organizer. We’d give MegaLand a recommendation with caution. It’s not great for kids (or adults) who get easily frustrated by losing in luck-heavy games, but the theme is great, the art is spectacular, and most of our plays did not swing on luck alone. The building portion we enjoyed much more than Machi Koro, our previous favorite tableau builder, because there were cool effects without any retribution against your fellow players. MegaLand is a Target exclusive and is available for just $24.99. For our international friends, ask for it at your friendly local game store. The Family Gamers received a review copy of MegaLand from Red Raven Games.